NDC will join investors and partners to celebrate the Grand Opening of a Affordable Family Housing Project located in Detroit, MI. 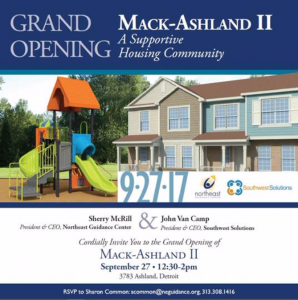 Mack-Ashland II provides 28- units of affordable housing, in 14 townhome buildings. Mack-Ashland II is the second phase of a larger Mack-Ashland Community Revitalization Initiative happening in the Eastside Neighborhood of Detroit.